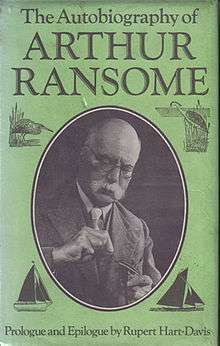 Ransome was the son of Cyril Ransome (1851-1897) and his wife Edith. Arthur was born in Leeds; the house at 6 Ash Grove, in the Hyde Park area, has a blue plaque over the door commemorating Ransome. Ransome's father was professor of history at Yorkshire College, Leeds (now the University of Leeds). The family regularly holidayed at Nibthwaite in the Lake District, and he was carried up to the top of Coniston Old Man as an infant. His father's premature death in 1897 had a lasting effect on him. Ransome was educated first in Windermere and then at Rugby School (where he lived in the same study room that had been used by Lewis Carroll) but did not entirely enjoy the experience, because of his poor eyesight, lack of athletic skill, and limited academic achievement. He attended Yorkshire College, his father's college, studying chemistry. After a year, he abandoned the college and went to London to become a writer. He took low-paying jobs as an office assistant in a publishing company and as editor of a failing magazine, Temple Bar Magazine, while writing and becoming a member of the literary scene of London. Ransome's sister, (Marjorie Edith) Joyce (1892-1970) married Hugh Ralph Lupton (b. 1893), the son of Leeds Lord Mayor Hugh Lupton. Joyce and Hugh Ralph had four children, giving one of their sons the name Arthur Ralph Ransome Lupton (1924-2009), in honour of the boy's famous literary uncle. Hugh's and Joyce's children shared with their extended family a love of nature and wetlands. When at home in Leeds, the children also shared a governess with their second cousin, Peter Francis Middleton (1920-2010), grandfather of Catherine, Duchess of Cambridge. Ransome married twice, first to Ivy Constance Walker in 1909 (they divorced in 1924) with whom he had a daughter Tabitha Ransome. His second marriage, in 1924, was to Evgenia Petrovna Shelepina who is buried in the same grave as Ransome. After the start of the First World War in 1914, he became a foreign correspondent and covered the war on the Eastern Front for a radical newspaper, the Daily News. He also covered the Russian Revolutions of 1917, coming to sympathise with the Bolshevik cause and becoming personally close to a number of its leaders, including Vladimir Lenin, Leon Trotsky and Karl Radek. He met the woman who would become his second wife, Evgenia Petrovna Shelepina, who at that time worked as Trotsky's personal secretary. Ransome provided some information to British officials and the British MI5, which gave him the code name S.76 in their files. Bruce Lockhart said in his memoirs: "Ransome was a Don Quixote with a walrus moustache, a sentimentalist who could always be relied upon to champion the underdog, and a visionary whose imagination had been fired by the revolution. He was on excellent terms with the Bolsheviks and frequently brought us information of the greatest value." In October 1919 Ransome met Rex Leeper of the Foreign Office's Political Intelligence Department, who threatened to reveal this unless Ransome privately submitted his articles and public speaking engagements for approval. Ransome's response was "indignant". 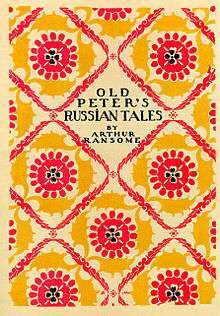 MI5, the British Security Service, was suspicious that Ransome and his fellow journalist M. Philips Price were a threat because of their opposition to the Allied Intervention in the Russian Civil War. On one of his visits to the United Kingdom, the authorities searched and interviewed him and threatened him with arrest. In July, 1951, he saw Norvad, a Hillyard five-and-a-half ton centre-cockpit yacht. With Evgenia, he had a trial sail in Norvad the following month in a hard offshore wind. They decided to get one, which he had decided should bear the name Lottie Blossom, and put in an order for that year’s Boat Show model. With a list of things they wanted done to modify the boat below decks from the standard production model, the boat was launched on April 1, 1952. Ransome's health problems delayed their first sail to 15 April. Lottie Blossom II followed early the next year, using the same design of hull, but with aft cockpit and tiller steering. They had two very happy seasons in her, sailing her comfortably on their own, including two voyages to Cherbourg. The second voyage, in 1954, at the age of 70, was to be Ransome’s last long passage. ↑ "Arthur Ransome – double agent?". BBC Local: Leeds. Leeds, England: BBC News. 1 December 2009. Retrieved 28 March 2010. ↑ Foxcroft, T.H. "Arthur Ralph Ransome Lupton". North Craven Heritage Trust - Journal 2010. Retrieved November 2, 2014. ↑ Ghael, Penny. "The Descendants of Thomas Ransome" (PDF). Page 10 - 2013, Charles E. G. Pease. Retrieved November 2, 2014. ↑ Joseph, Claudia. Kate - The Making of a Princess. Mainstream Publishing Company, 2009, Chapter 8 - Noel Middleton and Olive Lupton. Retrieved November 2, 2014. ↑ Chambers, Roland (2009). The Last Englishman: the Double Life of Arthur Ransome. Faber & Faber. pp. 67–69. ↑ Staff (2004). Annual Bibliography of the History of the Printed Book. 30. Den Haag: National Library of the Netherlands. p. 130. 1 2 Pallister, David (1 March 2005). "Still an enigma, our Petrograd correspondent". The Guardian. London. Retrieved 12 January 2010. ↑ Kettle, Michael (1992). Churchill and the Archangel Fiasco: November 1918 – July 1919. London: Routledge. pp. 225–228. ISBN 0-415-08286-2. ↑ Chambers, Roland (10 March 2005). "Whose side was he on?". The Guardian. London. ↑ Henley, Jon (13 August 2009). "I spy Arthur Ransome". The Guardian. London. Retrieved 25 April 2010. ↑ Strong, Leonard (1953). "Serials: Books for the young reader". The Writer's Trade. London: Methuen. p. 133. OCLC 503823758. ↑ Quoted from Walpole, Hugh (1934). British Books. 139. p. 248. ↑ Carnegie Winner 1936. Living Archive: Celebrating the Carnegie and Greenaway Winners. CILIP. Retrieved 23 July 2012. ↑ Avery, Gillian (2004). "Ransome, Arthur Michell (1884–1967)". Oxford Dictionary of National Biography. Oxford, England: Oxford University Press.